But dun mind those words - it's really great! About: "First time official reissue of one of Sweden's greatest and sadly unknown psychedelic treasure is this sole album by Joakim Skogsberg out of 1971. Tiliqua acquired the exclusive rights to this gem and this reissue comes with a remastered sound taken directly from the original master tapes and with the kind assistance of Mr. Joakim Skogsberg himself. 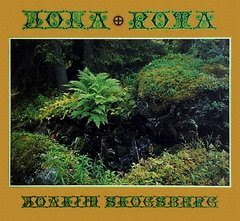 The album “Jola Rota” is about Joakim Skogsberg's love for the grandiose Swedish landscapes, which has put its imprint upon his songs. On “Jola Rota” Joakim single-handedly created a minimal psychedelic and acid folk masterpiece infused with incredible soundscapes of derailed fuzzed out violins, soaring guitars, rattling hand percussion, droning vocals and pulsating bass rhythms, complimented by Joakim's “jolor”, a special singing style with roots in an ancient Swedish tradition of folk music. The album was for the most part recorded out in the woods, with a portable Nagra-reel-to-reel-tape recorder and a simple Philips-cassette recorder. Upon completion it was suggested for the album to appear on Gump Records, a subsidiary of Metronome. The reason was that the music was just too underground and weird to be in Metronome's register. Apart from Joakim's original recordings, some overdubs and effects were done in the studio during the autumn of 1971. Some of the droning sounds on the record were recorded in a tiny closet in K?rrtorp; a suburb to Stockholm where Joakim was living at the time. The album was pressed into approximately 1000 copies and only about 300 to 400 copies were actually sold. The rest of them were melted down and used in the pressing of other Gump records, making “Jola Rota” a much rumoured and sought after Swedish droned-out and mesmerizing psychedelic artefact. This edition “Jola Rota” comes housed in high quality sturdy hard card mini-LP styled gatefold sleeve. Original artwork is faithfully reproduced and previously unpublished archival pictures can be found within the liner notes and gatefold. The liner notes are by the hand of Adam Gustafsson. Digitally remastered from the original master tapes and graced with faithfully reproduced artwork and obi. One time only limited pressing." UPD the archive reupped but if they'll report it once again - that's their will... think about it and really buy an original CD))) i won't be uploading it again. i understand the point of artists & labels and won't get tired to ask u guys to support 'em by buying stuff. hi - seems like the file's been removed already! any chance of repopsting it, please? both cheap + good people running them!